By using this hashtag, consumers will receive special savings on their purchase up until a certain date. This is such a great advertising mechanism for Mattress Firm. They’re not only “up-to-date” with their social media use, but they’re encouraging customers to advertise for them on two popular social media networks. These two sites have increased so much in popularity, that marketers are specifically targeting them rather than Facebook, which has been around longer than both Instagram and Twitter. 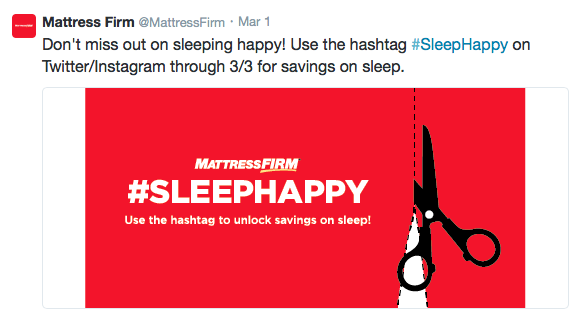 Even Mattress Firm specifically notes to use the hashtag on either of these two websites, but doesn’t mention Facebook (though you can hashtag on there as well). So my question for emerging media experts is, are we already pushing to “new” new media? Has Facebook already exhausted itself? I know my kids, both college students, have pretty much abandoned Facebook. The accounts are open so that they can “stay in touch with their grandparents and aunts and uncles” but they and their friends rarely post anything to it. Instagram, Vine, Twitter, and Snapchat are what they use. So it would depend on your target audience if Facebook is still relevant.